Wishing you that, on this, the shortest day of the year, your night is filled with family, friends and all the warmth you can generate! As for my family, we will be making our traditional trip to the beach (Moonlight, in Encinitas in case anyone wants to join us) to frolic in the dunes and watch the sun set and enjoy a bonfire. Afterwards, we will partake of the Solstice Cake - 2/3 chocolate and 1/3 vanilla. 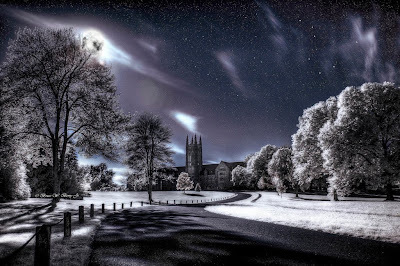 This stunning photo is titled Winter Solstice was created by Bruce W, Berry Jr. His photos are amazing and I encourage you to check them out. I will be taking a break as the year ends and will return on January 1, 2010 with my round up of best picture books of the year. In case you missed it, you can read Best Picture Books of 2008 posted on January 2, 2009. And don't forget, the Newbery and Caldecott Awards are right around the corner. Here is the round-up of last year's winners. Hi! I just found you via Serendipity because of Book Sharing Monday, and I'm so glad I did. Have now added you to my links on my blog and will be returning! Thanks so much! Please feel free to email me with any questions. Hope you enjoy my reviews. Happy reading!